The area of a rectangle is 49 cm2 and its breadth is 2.8 cm. Find the length of the rectangle. The side of a square is 70 cm. Find its area and perimeter. The area of a rectangle is 225 cm2 and its one side is 25 cm, find its other side. (i) If the length and breadth of a rectangle are trebled. Let the initial length and breadth be l and b, respectively. the length and breadth are trebled which means they become three times of their original value. Thus, the area of the rectangle will become 9 times that of its original area. (ii) If the length is doubled and the breadth is same. Now, length is doubled and breadth remains same. 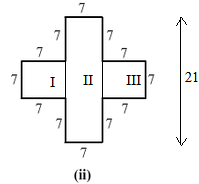 Thus, the area of the rectangle will become 2 times that of its original area. (iii) If the Length is doubled and breadth is halved. Let the initial length and breadth be land b, respectively. Now, length is doubled and breadth is halved. New area is also lb. This means that the areas remain the same. (i) Let the original side of the square be s.
If the side of a square is tripled, new side will be equal to 3s. This means that the area becomes 9 times that of the original area. (ii) Let the original side of the square be s.
This means that the area becomes 9/4 times that of the original area. Find the perimeter of a rectangle whose area is 500 cm2 and breadth is 20 cm. A rectangle has the area equal to that of a square of side 80 cm. If the breadth of the rectangle is 20 cm,  Find its length. Area of a rectangle of breadth 17 cm is 340 cm2. Find the perimeter of the rectangle. A marble tile measures 15 cm × 20cm. How many tiles will be required to cover a wall of size 4m × 6m? A marble tile measures 10 cm × 12 cm. How many tiles will be required to cover a wall of size 3m × 4m? Also, find the total cost of the tiles at the rate of Rs 2 per tile. One tile of a square plot is 250 m, find the cost of leveling it at the rate of Rs 2 per square meter. 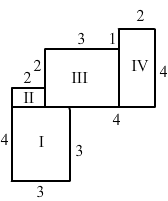 (i) This figure consists of two rectangles II and IV and two squares I and III. 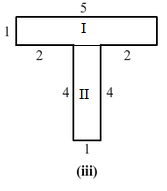 (ii) This figure consists of three rectangles I, II and Ill.
(i) This figure consists of two rectangles I and II. 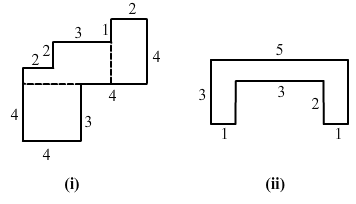 (ii) This figure consists of two squares I and III and one rectangle II. 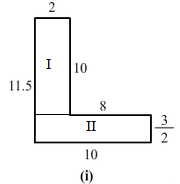 (iii) This figure consists of two rectangles I and II. How many tiles with dimension 5 cm and 12 cm will be needed to fit a region whose length and breadth are respectively?